Unlike the previous year the Drama Club entries in the Essex Youth Drama Festival did not produce a winner in either the Junior or Senior sections of this, the ‘Area Round’ of the County wide competition – which was probably the reason why there was no comment, or further information about the performance or the cast, in the subsequent Walthamstow Guardian Report! However, the fact that the Guardian report shows that this was the ‘Area Round’, means that the Drama Club must have won the local ‘Walthamstow Round’. Guardian Report. 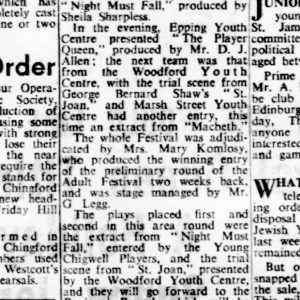 1959 Essex Youth Drama Festival. March 1959.